Eurasia. is the project of a 20 years-old Japanese boy who his inspired by the bucolic countryside in the city of Wakayama. 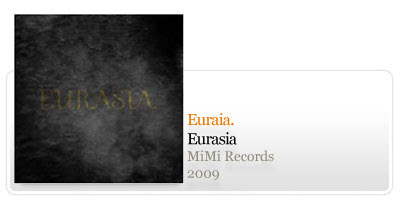 The 4 songs that make the debut of Eurasia. in MiMi grow in-between the ambiences and the keys of a piano with classical melodies. Akira, fictitious name behind Eurasia., is an anti-hero. Assume the lack of theory and technique in his compositions, but, in the end, he makes the music that he wants to hear. "The end of the autumn" is the song closest to what is called post-rock, is also the composition where the piano has a greater role than ambience layers that rise by the end of an EP that seems have in the autumn a good ally. The coordinates that surround the ambient and the post-rock are brought by Eurasia. on another release with the stamp of MiMi.